In 1920, Indiana University founded the School of Commerce and Finance. After swiftly changing its name to the School of Business Administration in 1933, the school was renamed again as the School of Business just five years later. In 1997, the school officially changed to its current title as the Kelley School of Business, named after E.W. Kelley, an alumnus who generously donated $23 million to the business school. The Kelley School of Business has two primary locations in Indiana: Bloomington and Indianapolis. The Indiana University–Purdue University Indianapolis (IUPUI), a joint merger between Indiana University and Perdue University, hosts an Evening MBA and Business of Medicine MBA in center city Indianapolis. The IUPUI campus located less than 15 miles from the Indianapolis International Aiport. The Kelley School is comprised of two buildings located on the center of campus, and the $33 million, 180,000 square-foot Godfrey Center is home to Kelley’s full-time MBA program. The Godfrey Center is remarked as one of the most tech-savvy facilities in the country, featuring a Financial Trading Lab, which gives students an opportunity to work with technology used in Wall Street firms. 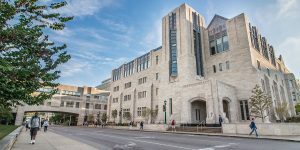 Across its Bloomington and Indianapolis campuses, the Kelley School of Business has over 300 faculty members, almost half of whom are tenure track. Nearly three quarters of the faculty holds a Ph.D., JD, or Ed.D. terminal degree. The faculty is known for their frequently downloaded publications, as they have published hundreds of journal articles and books in the span of only a couple of years. As part of the Online MBA, Indiana University employs 96 faculty members, 95 of which work full-time, and 54 of which are on tenure track. Nearly 10,000 total students are enrolled in the University of Indiana Kelley School of Business’ Bloomington campus. Over 7,500 students are enrolled in the undergraduate program, with 388 full-time MBA students, 993 Online MBA and MS students, 597 Executive degree students, over 100 3/2 MBA students. Just over 1,700 students are enrolled in the school’s programs at its satellite Indianapolis campus, with 304 Evening MBA students and 85 Business of Medicine Physician MBA students. The Kelley School of Business in features a traditional full-time MBA, Online MBA, Global MBA, and the 3/2 MBA. Students at the IUPUI campus have access to the Evening and Business of Medicine MBA programs.